The involuntary manslaughter case against Michael Jackson's cardiologist has been assigned to a new judge in a brief proceeding in Los Angeles. 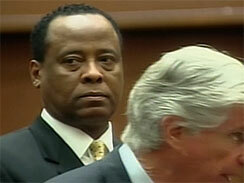 Dr. Conrad Murray, his attorneys and prosecutors assembled Monday before Supervising Superior Court Judge Peter Espinoza, who quickly assigned the case to Judge Michael Pastor and sent them to his courtroom. Issues awaiting the new judge include setting a date for a preliminary hearing and Murray's fight to keep his California medical license. The state attorney general, representing the state medical board, has moved to revoke Murray's license pending trial. Jackson died from acute intoxication with the hospital anesthetic propofol and other sedatives. Murray has pleaded not guilty. About 50 Michael Jackson fans waved signs and chanted outside the courthouse Monday in anticipation of a hearing in the involuntary manslaughter case against the pop star's doctor. The fans sang "We Are the World," wore T-shirts emblazoned with Jackson's picture and the slogan, "Justice 4 Michael," and carried placards demanding stronger charges against Dr. Conrad Murray. Fans in a courthouse hallway called out "Hi Janet" as Janet Jackson arrived. Murray has pleaded not guilty to involuntary manslaughter, and the Superior Court hearing was to assign a judge to try the case and to set a preliminary hearing date. Normally, such a procedural hearing would draw few spectators. But with Jackson's death as the backdrop, fans and media showed up, and Jackson family members have committed to attending all court proceedings against Murray. If convicted, Murray could face a maximum sentence of four years in prison. Sandi Gibbons, spokeswoman for the district attorney's office, said the Jackson family notified court officials that up to 15 courtroom seats would be needed. "It's basically a housekeeping hearing, but it will be the housekeeping hearing heard around the world," said Loyola University law professor Laurie Levenson. "I'm already getting e-mails from France. There is no detail too minute for the international media." Murray is fighting to keep his medical license. The California attorney general, representing the state medical board, has moved to revoke his license pending trial. Murray says that if he can't continue practicing medicine, he will have no way to pay for his defense. The doctor has a history of serious financial problems and his attorneys, Ed Chernoff and Joseph Low, said in a recent court filing that the effect of losing his license would be devastating to Murray. Murray, 57, a cardiologist, has clinics in Las Vegas and Houston and also has a license to practice in California. Should his California license be lifted, his lawyers suggest there would be a "domino effect" with other states moving to do the same. Already, Nevada authorities have filed a formal complaint against Murray saying he twice failed to mention delinquent child support payments on applications to renew his medical license. Miranda Sevcik, spokeswoman for Murray and Chernoff, says Murray's legal team hopes to resolve the complaint in a way that allows the doctor to keep his license. As a condition of his $75,000 bail, Murray has been ordered not to administer any anesthetic. Jackson was 50 and about to launch a series of comeback shows in London when he died last June after being rushed to a hospital from his Beverly Hills home. Murray, who signed on in May at $150,000 a month to keep Jackson healthy through the comeback tour, told police he had been treating him for insomnia. The legendary pop star was found to have died from acute intoxication with the hospital anesthetic propofol and other sedatives as a contributing factor. Chernoff has said that nothing Murray gave the singer should have killed him. The defense is expected to complain Monday that prosecutors have been slow turning over the case records under discovery laws. Gibbons said there are "hundreds of thousands of pages" of material to be catalogued and stamped before it is turned over. "We are giving them two to three thousand pages at a time," she said.